Buckeyes, I want to take a moment to introduce my Sergeant Major and myself and to give you an update on the Buckeye Battalion. I assumed the position of Professor of Military Science on 8 August 2014. I am a 1997 graduate of Frostburg State University in Maryland and was commissioned through West Virginia University. I am a Logistics officer and have served at every level, including my previous assignment on the Army Staff. My Company grade positions were held at Ft Stewart and Hunter Army Airfield and I completed my Field Grade Key Developmental jobs at Ft Carson with the 4th IBCT, 4ID. I’ve deployed twice; once to Baghdad, Iraq as an advisor and once to Jalalabad, Afghanistan as the Brigade SPO. MSG Petty assumed the position as Senior Military Instructor in January 2014. He joined the Army in October 1999 as a 19K, Armor Crewman. He has served as a Tank Loader, Gunner, Tank Commander, Infantry Platoon Sergeant, and First Sergeant. MSG Petty served as the 1SG for two Companies, D/1-8 Armor and for his previous unit, Headquarters and Headquarters Company 3rd Special Troops Battalion at Ft. Carson, CO. He has four operational deployments; one to Kosovo and three to Iraq. He is currently pursuing a bachelor’s of science in computer science with the University of Maryland. MSG Petty was selected for Sergeant Major and will be attending the SGM Academy next summer. Thanks to my predecessor, the Corps of Cadet is stronger than ever. I plan to build on the success and continue to commission the finest officers in the Army. Here are several initiatives that we are currently working on: Alignment with US Army Cadet Command’s strategic plan There are many changes being implemented over the next 12-24 months. These changes will shift the focus to training the seniors instead of preparing the juniors for the Cadet Leader Course (Advanced Camp/LDAC). First, the Cadet Leader Course will no longer be a graded event for rising MSIVs, it will be a developmental exercise similar to our Mission Rehearsal Exercises at NTC or JRTC. Many of us have participated in an NTC or JRTC rotation and we all know that, even though it was not graded, it was world class training that prepared us for our missions. Second, the MSIV Curriculum has completely changed from previous years. This is the first change in decades and is aimed at producing adaptive, critically thinking, and ethnically sound, officers. The Chief of Staff of the Army’s goal is to ensure curriculums from all commissioning sources are similar. ROTC, West Point, and OCS are synchronizing their curriculums. Lesson plans are very similar to something you may have seen at CGSC or other courses in your career. They include topics like, Mission Command, Military Decision Making Process, Operations Process, Operation Orders and Rehearsals, Law of War, Organizational Ethics, SHARP, Counseling, and Officer Career Planning just to name a few. Some people are concerned about the paradigm shift in training cadets. Their argument is that, they were a product of the “old” system and they’ve done fine. Let me be clear, the old system did not produce less qualified officers, but we are in an ever changing environment and our training should also change to meet these challenges. I, too, am a product of the old system and I believe that the system needed to change. We are successful as an Army because we were forced to learn, adapt, and change on the battlefields of Iraq and Afghanistan. We received on-the-job training and are stronger because of it. The curriculum changes instill these lessons in our future Second Lieutenants. Army Drawdown and Commission Mission The Army is getting smaller and in the future we could see our commission mission decrease. The Army has over-commissioned officers over the past several years. That being said, The Ohio State University ROTC mission has remained stable and, in fact, increased in previous years. We do not foresee our commission mission dropping in the near future. Our commission mission is normally 25 cadets, we’ve been asked to exceed our mission to make up the shortages from other programs and we will commission 37 cadets this year. As the Army draws down, we may see a drop in the number of cadets assessed on to active duty. Last year, nationally, about 50% of cadets across the country received active duty. The Ohio State University commissioned nearly 60% of our cadets into the active duty force. It is becoming more and more competitive, but we will continue to exceed the national average. I am also aware that the selective separation has hit our officers hard in the past months. While I do not have visibility of The Ohio State University Alumni who were affected by separation, The Ohio State University Army ROTC Alumni Association would like to offer their assistance for anyone who has been forced to leave the active duty force. If you need assistance with career preparation or job placement, please contact me and I will get you in touch with The Ohio State University Army ROTC Alumni Association. State of the Corps of Cadets We currently have 186 cadets in the program. There are 37 MSIVs who will commission this year. These seniors absolutely knocked it out of the park during summer training. Over 33% of them returned from camp with an overall rating of “Excellent.” The national average for an “E” at camp is 17%. So our cadets left no doubt in Cadet Command’s (and Michigan’s) mind who has the best program in the country. 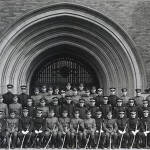 It is THE Ohio State University Army ROTC Alumni Association. State of the Corps of Cadets We currently have 186 cadets in the program. There are 37 MSIVs who will commission this year. These seniors absolutely knocked it out of the park during summer training. Over 33% of them returned from camp with an overall rating of “Excellent.” The national average for an “E” at camp is 17%. So our cadets left no doubt in Cadet Command’s (and Michigan’s) mind who has the best program in the country. It is THE Ohio State University. Army ROTC is an elective curriculum you take along with your required college classes. It prepares you with the tools, training and experiences that will help you succeed in any competitive environment. Along with great leadership training, Army ROTC can pay for your college tuition, too.